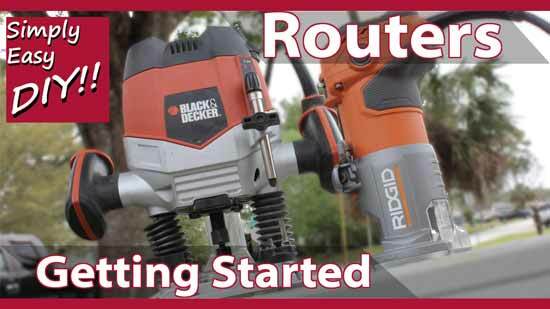 Do you need a woodworking router? Good question. Some would say yes, couldn't get by without it. Often times the question is asked of those who have been doing woodworking and diy projects for many many years. Why not, right. When you want sound advise, that you can count on, you go to the experts. Unfortunately a lot of experts in woodworking tend to think with wide open pocket books. Not good if your a home owner that will only be doing the occasional project. So lets ask this question again and think in terms of limited budget, know how and need. This post and video is part of a series called "Beginner Tutorials". To see the complete series click here. By the way if your curious as to the routers that I have in my shop and show in the video, here is My Plunge Router. I can't find my specific table top version anymore, it is kinda old. I think this is the updated version. Finally, this is my trim router. OK, I lied. This is the finally I was referring too. This is my straight edge clamping tool that people have asked about in the video. I am in no way endorsing any of these tools or trying to persuade you that they are better than any other model on the market. I am merely listing the specific brands to satisfy those that may be curious. However, the chart above or any chart for that matter can not interpret the situation. Certain species of wood will have a their own tendencies in regards to burning, splitting and blow out. Therefore a certain level of experience is needed for any given situation in order to know an approximate rotation and feed rate. Appropriate speeds are usually below maximum RPM. I recommend a test cut with the speed control setting on its slowest rotation speed for the bit size being used. Then gradually increase until the cut is acceptable. Speeds near the max RPM of the machine are only suitable for a 1" bit or smaller. A bit twice as wide should rotate at half the speed. At the same RPM, a bigger bit has a faster surface speed than a small one. If a big bit rotates too fast, it will have a tendency to burn the work piece. 1/2" shanks have nearly four times the mass of the 1/4" shank bits. That means greater stability. The extra mass reduces what is known as "chatter". Chatter is vibration caused by the high speed of the spinning bit and/or the shank not being seated properly in the cullet. The extra mass could make a cleaner cut and dissipate heat resulting in longer life. Advantages to 1/4" bits are that they're typically much less expensive and more readily available. You'll find 1/4" bits in just about any hardware store and home center. Plus, some inexpensive router manufacturers don't even make models with 1/2" cullets. Routing a very thin profile is more practical with a 1/4" shank bit as opposed to a 1/2". When choosing between 1/4" shanks and 1/2" shank machines, the choice is up to you. Personally, all my routers are 1/4" simply because I don't do routing that requires extremely large bits which would be impractical with a smaller shank. Working against the bit’s rotation is always the safest and recommended approach. No questions asked and no one is refuting that information. However, sometimes the species of wood you’re routing will have difficult characteristics. Perhaps the grain direction that your forced to travel doesn’t rout smoothly. Working against the bit’s rotation will cause tear out and blow out. obviously that is unacceptable in some situations. When this happens I will sometimes move the router with the bit’s rotation instead of against it. That is called climb cutting and is somewhat controversial in nature. It's called climb cutting because feeding with the rotation of the bit will make the router want to "climb" out of the cut instead of digging into it. Instead of feeling the resistance against the wood, the router will want to grab the wood and pull away from you. So, the machine is harder to control and less predictable. Climb cutting must be done cautiously with a capital C.
I will often use this technique in order to prevent blowout at the end of a dado or rabbet. I will route my dado as usual to begin with until I get to the end of the cut. Then I will lift the router out of the cut and come back against the piece for the last 1/2" or so. I like the information you are sharing. I have four routers, had five but gave one away as it did not have a base plate and was to old to keep. I, made some cages last year, where I wish I had a trim or plunge, it would have been real helpful, I now have these. I'm very interested in the jigs for mortise and tendon joints and always looking for new ones to make. I know there are a lot of jigs out there that use threaded rods and the such, but really too complicated and I don't do inside furniture or any real inside work, so I'm not wanting to put forth the time or effort to build one, and others that are manufactured are too expensive for me. I do mostly outdoor items, for the garden or patio, or for outside pets.